Synchronize one or more of your mail.com Organizer with your iPhone/iPad to keep your appointments up to date and you never miss one. You can use your mail.com Organizer with the calendar app that comes with your iPhone/iPad. Open the Settings on the home screen of your iPhone/iPad. At the very bottom, select Other. Enter https://caldav.mail.com/ as the server address. If applicable, enter a description of the calendar. Your calendars are synchronized. 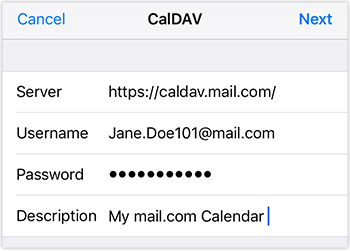 If you edit your mail.com Organizer, the changes will appear in the calendar on your iPhone/iPad and vice-versa.